1. Donaghmore. General View. North Side. South of Church, Donaghmore, Co. Down. This is a composite cross, re-erected in 1891. It does have roll mouldings at the edges, but the representations on the edges are not framed and without obvious panels are at times difficult to decipher. N2 David encounters Goliath (Harbison, 1992, 68). Ancient Monuments in Northern Ireland not in State charge 1, , Belfast (1952) . An Archaeological Survey of County Down 1, , Down (1966) . Cowan, J. D., An Ancient Irish Parish past and present, being the Parish of Dromore, County Down 1, , London (1914) . Harbison, Peter, , ‘On some possible sources of Irish High Cross Decoration’. In Festschrift zum 50jahrigen bestehen des vorgeschichtlichen seminars Marburg. Marbuger Studien zur vor- und Frühgeschichte I (1977) 283-297. Frey, O.-H., Festschrift zum 50jahrigen bestehen des vorgeschichtlichen seminars Marburg. Marbuger Studien zur vor- und Frühgeschichte I 1, , Gladenbach (1977) . 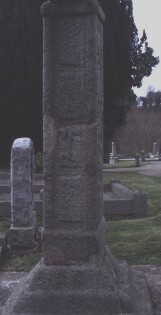 Lett, H. W., , ‘St Macerc's Cross, Donaghmore, Co. Down’. In Annual Report and Proceedings of the Belfast Naturalist's Field Club, 2nd Ser. (1892) 3, 5, 390-394.